Jeffrey Catalano, a partner with Todd & Weld LLP, and Carole Cooke, an associate with the firm, obtained a $4M settlement on behalf of a 19-year-old driver who was permanently paralyzed from the waist down when her car was struck by a tractor-trailer. The collision occurred on an entrance ramp onto Interstate 495. Both sides of the ramp were flanked by huge snow banks, following record snowfalls. The defendant was driving a tractor-trailer for his employer, an intrastate trucking company, down the same entrance ramp directly behind and too close to the plaintiff's car. Defendants denied liability, arguing that the plaintiff was contributorily negligent by failing to observe the protruding snow bank, thereby causing her SUV to flip over and land in the road. Plaintiff's counsel retained an expert who testified that the truck should have been 6-7 seconds behind the car. 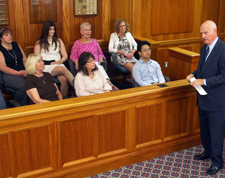 An animation presented at mediation demonstrated that if the defendant had been 6 seconds behind the plaintiff, he would have had time to bring his truck to a stop without crashing into the car. Plaintiff also asserted a claim against the trucking company for negligent hiring, retention, training and supervision of the defendant driver. Through discovery, plaintiff's counsel determined that the defendant trucking company violated numerous state regulations by failing to obtain the driver's motor vehicle record prior to hire (which included numerous traffic accidents); failing to appropriately train the driver; and for many years failing to perform annual checks of his driving record.